I read something from Organic Gardening Magazine (via an email) that said ripe tomatoes will keep in the refrigerator several weeks. I’ve tasted refrigerated tomatoes and found them flavorless and tasteless. 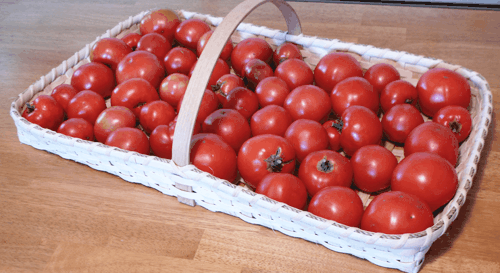 During peak season I keep tomatoes in a single layer flat basket in a cool place with constant air circulation away from direct sunlight. 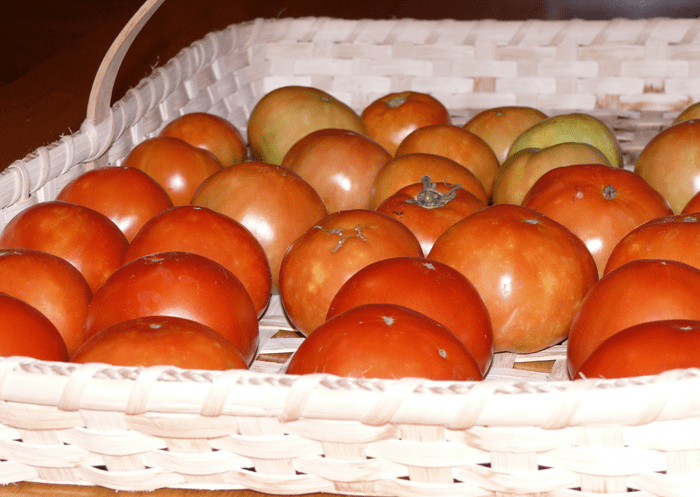 If the basket fills with ripe tomatoes, I know it’s time to start preparing and freezing for winter use. I try to keep tomatoes on the vine as long into the season as possible. If I know an early frost is expected I will try to throw some Reemay, newspapers, an old sheet or some means of temporary protection over the plant for that night. Here in Virginia if you can get through that first frost or two you may have weeks more that will be perfect for tomatoes on the vine. Once I expect frost to occur more regularly, I bring in all the partially ripe and green tomatoes. I have a friend who was raised on a farm and they use to pull up the entire tomato plant when frost was expected and hang them upside-down in the barn and harvest tomatoes as they ripened on the vine. If I had the space, this would be the way I would go! The article in Organic Gardening Magazine (mentioned above) also suggested that you wrap green tomatoes in newspaper to slowly ripen them. I use to do that years ago. Since you must check the tomatoes frequently to make sure any rotting ones are removed, it got to be a pain. It is much easier to check if the tomatoes are not wrapped. Having had success for many years doing it this way, I see no advantage to going to the extra work in wrapping them. As with my in-season tomatoes, I keep them where it is cool with constant air circulation and away from direct sunlight. I try to keep the green tomatoes in my single layer basket as well. Sometimes the harvest is too great and I have to put them in an additional basket that is deeper. Just remember — you must check them because it is normal for some to rot. One last thing that may help you in your effort to eat fresh tomatoes through Christmas: As December comes and the tomatoes diminish they don’t look as beautiful as they did in peak season. This can fool you. I have cut into a tomato on Christmas day that I was sure I would probably have to throw away. It appeared almost all green with a hint of pink on one end. When I cut into it — it was as deep red/pink, juicy as a July tomato, and with all the flavor I expect from a fresh fruit. Things are not always as they seem. So test first before you throw it away. If you love tomatoes as we do, it will be worth the effort. I was shocked when I saw that same e-mail; what were they thinking! I have never tried keeping unripe tomatoes because I thought the newspaper wrapping (and unwrapping and re-wrapping) would be a pain in the neck. This year, I am going to hang a few of our favorite plants upside down, root a cutting or two of a few indeterminates to grow under lights in the basement seed starting area, and will try to save the rest in shallow baskets in a cool dark place with fan circulating. The idea of having real tomatoes still viable by Christmas morning would indeed be a fine gift. I will be anxious to know how you do with the tomatoes. If you have them through Christmas morning I know first hand how thrilling it is. Probably lots of people keep them in the dark since it is so widely promoted, but there is something about light that I feel helps rather than hurts in this particular situation. I am enjoying ALL of your articles! I have to make myself leave the computer and take care of household duties:-) Thank you for sharing your experiences. I have renewed hope that maybe my garden can (will) be a success. You absolutely CAN be a success Laura. I will be happy to help in any way I can. American Test Kitchen many months ago showed a test whereby tomatoes stored at room temp upside down would last longer than those stored right side up. I became a believer. And this if fine when I only buy one tomato at a time. But I often buy my tomatoes still on the vine. So do I remove them from the vine to store this way or leave them on? One of the best ways to keep tomatoes after frost is to hang the vine in a barn or shed or porch. If I had room, that is what I would do. I wouldn’t be too concerned about whether they were upside down or right side up.